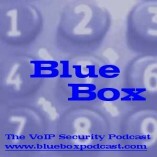 Welcome to Blue Box: The VoIP Security Podcast show #2, an 24-minute conversation between Dan York and Jonathan Zar around news and commentary in the world of VoIP security. With this show, Jonathan Zar joins as a co-host. Jonathan also was just back from the Internet Telephony show in Los Angeles and so much of the discussion included feedback coming out from the show. Download the show here (MP3, 22MB) or subscribe to the RSS feed to download the show automatically. 01:43 - Discussion of last week's Skype security alerts: SKYPE-SB/2005-002 and SKYPE-SB/2005-003. Including the quick response as well as some of the media coverage. 02:30 - Review of the last week's traffic on the VOIPSEC public mailing list, which was actually quite quiet with only a few posts about the Skype security evaluation (mentioned in show #1) and an invitation to submit papers to a conference. Dan mentioned that David Endler, the chair of VOIPSA, had just sent out a note that he was removing moderation from the list, so we will see how the traffic goes over the next week. 22:53 - Wrapup of the show and information about how to provide comments.